Creosote is the combination of wood particles, flying ash and volatile gases as they leave your chimney. If not properly ventilated, the creosote can stick to your chimney, causing buildup on the wall. Stage 3 creosote is a very thick tar-like glaze and without proper removal can cause a fire within your chimney and home. While you could hire a professional chimney sweep to come out and clean it, that can be very expensive especially if you do it yearly or more often. Instead, you can remove Stage 3 creosote yourself for much less. Put the creosote removal powder onto the chimney brush. Brush along the walls of your chimney and up the flue, getting creosote removal powder on all areas. Light a fire in your fireplace. Make sure the fire gets up to a minimum of 300 degrees Fahrenheit. This will allow the creosote powder to loosen and remove the creosote from the walls and flue. Brush out the chimney once the fire has died out to help remove the creosote. Repeat Step 1 through 4 daily until the creosote has been completely removed from your chimney. This can take between two weeks and two months. 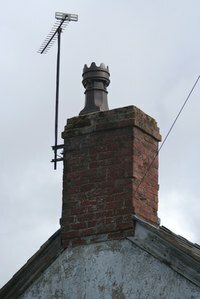 Once you have cleaned your chimney, you may want to have a professional look it over to see if any structural damage was done by the creosote build up. They may also be able to correct any issues with your chimney that caused the build up in the first place. Once you have cleaned the chimney, you can buy a spray form of creosote cleaner to keep the chimney creosote free. Every time you light a fire, spray the fire five or six times with the creosote cleaner to keep the creosote from building up. Creosote removal powder is a toxic chemical. It should always be stored in an upper locked cabinet away from pets and children.